This is a seriously useful book for any GM. 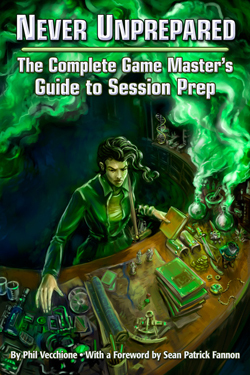 Never Unprepared is exactly what it says on the cover: “The complete Game Master’s guide to session prep”. If you read my last post then you are aware of the pain that both myself and the group I game with have been suffering through. As it turns out I got my diagnosis completely wrong. This book told me why. As for not liking prep, it is my belief that the reason that many GMs do not enjoy it is because they are doing it wrong. That may sound bold, and I will defend that point later on in the chapter, but I think that prep has been given a bad reputation over the years. In the way that many parts of our hobby are passed down from experienced GM to new GM, I think that we older GMs have perpetuated the belief that at best prep is some kind of necessary evil and not an enjoyable, creative process. In short, I’ve been doing prep all wrong. More accurately, it turns out that I’ve not really being doing much prep at all. I’m one of those annoying GMs who can improvise a session very well, rolling with a basic scenario starting point and delivering a fun evening of gaming. All well and good, you’d suppose. The problem with impro is that, once the session is over, that is that. It’s very hard, after a day or two, to remember many details from the session. This leads to my inability to keep a game going because, if I can’t keep the details straight, then the players don’t have a reliable setting to continue playing. With my heavy schedule of work and home life, plus my desire to avoid prep because “it is some kind of… evil”, no game that I run can ever have legs. I have been, for many years, the one-shot GM. And everyone knows that the secret to any relationship lies in being able to sustain more than a one-shot good time. Never Unprepared delivers a thought-and-action-provoking series of reflections, backed with practical advice and processes, which allows the GM to put together their own prep system. Prep system, you ask? Yes. You really do need a process. Trust me, I’ve tried living without it. Phil has got a five-step, logical and user-friendly approach to prep. After reading the whole book I felt genuinely relieved and heartened. When you are staring down the barrel of feeling like you have to give up your hobby of 30+ years, with tears in your eyes, a book like this one saves your life. Or at least your soul. In short, without boring you with the details, I’ve put together a draft process for getting my prep done on a two-week rota. This means I now believe that I can deliver a game every two weeks on Friday nights for my guys. In all honesty, my ability to deliver a game for the hobby club at school is looking decidely shaky… but I can always opt for one of two alternatives: a) run wargames; b) re-run stuff I prep for Fridays. Come hell or high-water, though, my mates and Friday nights have to come first. With the school holidays arriving in a week it feels like the best time to start the new regime and see how it pans out. True, I need to stick to my plan and deliver… but that’s easier for me because, in all things professional, I have long accepted the need for process. The real joy of Phil’s book is that he helps you to make the prep stuff fun. Yes, honestly – fun! If you’re a GM who’s stuck with prep then you will probably benefit from this book. I guess it’s never “one size fits all”… but then Phil’s book isn’t like that. He wants you to develop your own skills as a Never Unprepared GM.